Aloo Parathas are a common sight on most indian tables for breakfast. This whole wheat dough is rolled and stuffed with many stuffings, potatoes being the most common. 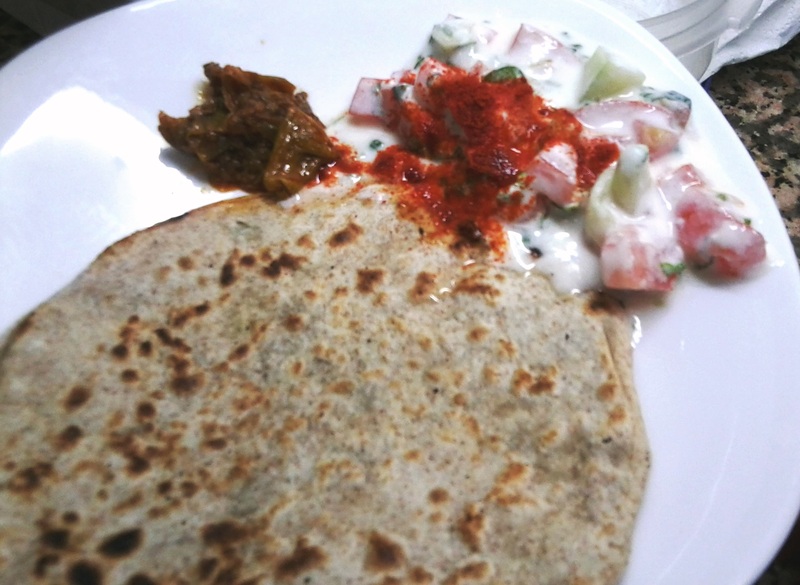 It is then served with a variation of chutneys, raitas and pickles. In my home we eat it for lunch or dinner and i make it OIL FREE. I am going to give you the normal recipe and if you are watching your calories just omit the oil. mix the potatoes with all the ingredients above. take the dough and make it into small balls. With the help of some dry flour flatten it with your hand and roll it into a small round with the rolling pin. Spread some potato filling on one dough round and cover it with the other and seal the edges well. Roll it out again a bit gently to flatten and even it well. Heat a iron non stick gridle and cook the paratha on both sides till done. YOU CAN ADD GHEE OR BUTTER….. i did not!!! This entry was posted in Everything Vegetarian, Floury Matter, Indian Restaurant Dishes and tagged flour, indian bread, paratha, potatoes. Bookmark the permalink. ummmmm que ricas… voy a hacerlas asi rellenas porque las que hice sin rellenas estaban buenisimas asi que estas…..tienen que estar deliciosas y con un surtido de chutny????? guau!!!!!! !